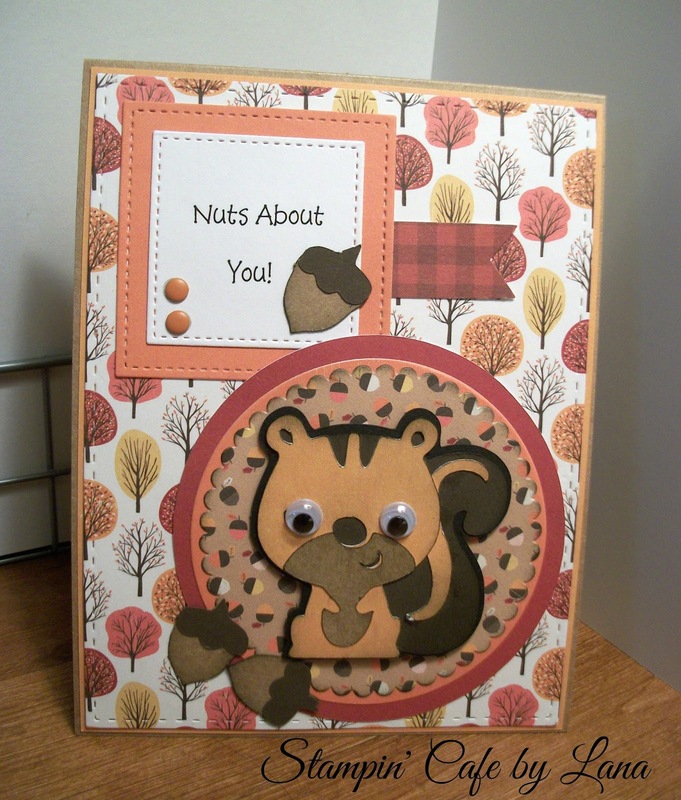 This "Nuts About You" squirrel card was made for my 5-year-old granddaughter. She loves the squirrels in our backyard and collecting the acorns that fall from the neighbor's oak tree. She also likes jokes, so I thought this would be a fun card for her! The card base is 4-1/4 x 5-1/2, top folding, in kraft cardstock. I added a layer of pumpkin pie colored cardstock and then a layer of fall trees patterned paper from the Carta Bella Hello Fall 6x6 Paper Pad. This is such a versatile pad, all double-sided papers, and a nice weight! The squirrel is from the Cricut Create a Critter Cartridge, p. 32, cut at 2 inches. I also cut the coordinating acorns on the same page, inking the edges with brown ink. I also inked around the cut squirrel and added some small googly eyes. The squirrel was then added onto a scalloped die cut circle using another paper from the same Carta Bella paper pad, and that was layered onto a pumpkin pie colored circle, and then onto a burnt orange colored circle. I chose not to use the "nuts about you" cut out from the same cartridge and instead printed it out on my computer. I cut it out using stitched framelits from Stampin' Up, first in white, and then in the pumpkin pie color. I added another cut acorn and two small orange enamel dots. I flagged it with a small strip of paper from the same Carta Bella paper pad. I think my granddaughter is going to love this card! She is a cardmaker and stamper as well. She even asked for her own stamp set for her birthday!